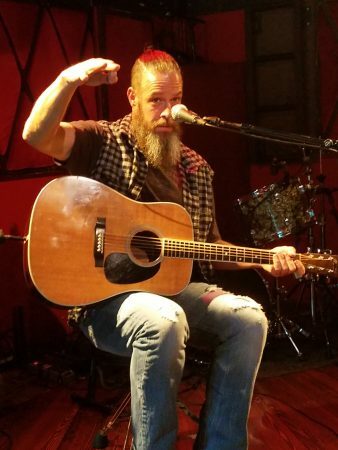 Saigon Kick co-founder Jason Bieler, in the midst of a string of one-man acoustic performances, recently proved once again why the singer-songwriter’s gigs have been so well-received by everybody who attends them. More of a sporadic schedule of shows than a full frenetic flock of back-to-back dates, Bieler is clearly having a copious amount of fun at the informal events. His enthusiasm for his solo jaunts was distinctly evident on July 14 at the Rockwood Music Hall in New York City. While Bieler has gone on record as saying that this recent run of concerts has provided him with more pure pleasure than any previous tours he’s embarked on, he’s quick to point out that his feelings aren’t meant as a knock on his tenure with his most well-known band, the Miami, Florida-formed alternative/metal powerhouse outfit Saigon Kick. Instead, it’s simply the casual nature of these intimate showcases that have revitalized the charismatic guitarist’s passion for performing live. Bieler took his time mingling with the crowd before taking the stage, greeting familiar faces who’d been in attendance previously, as well as newcomers who were about to experience his interactive show for the first time. 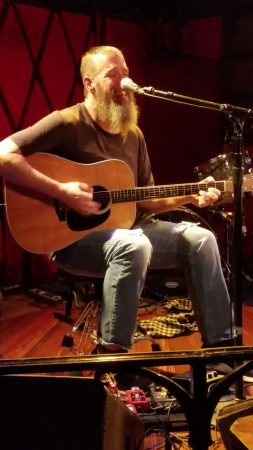 Fans were treated to a variety of material spanning Bieler’s entire career, from recent compositions such as the stellar “Satellite,” recorded under his Owl Stretching moniker, to eclectic covers ranging from The Beatles’ “Dear Prudence” to Katy Perry’s “Firework,” to “Super Down,” his underrated cut off 1999’s American Pie soundtrack, originally recorded as a member of Super TransAtlantic. But obviously, Saigon Kick was sufficiently represented as well. And while early-era Kick classics like “Coming Home” and “Down By The Ocean,” from the group’s self-titled debut, in addition to seminal Lizard cuts such as “All I Want,” “Hostile Youth,” and power ballad “Love Is On The Way” certainly pleased long-time followers, it was the subsequent Saigon songs that were the evening’s highpoints and the response was not a surprise. Although the definitive lineup of the band, including original vocalist Matt Kramer, reunited for a spattering of shows starting five years ago, the sets were strictly limited to tunes from their freshman and sophomore releases, due to Kramer’s lack of involvement in any projects that followed them. This resulted in diehards clamoring to hear favorites from the underappreciated Bieler-led gems 1993’s Water and 1995’s Devil In The Details – and he didn’t disappoint. A haunting version of “Russian Girl” mesmerized the crowd while stunning renditions of “One Step Closer” and “Sgt. Steve” whipped the audience into a frenzy. Anecdotes were aplenty at the Lower East Side venue as well. Though there were several fascinating ones, the most riveting story actually involved Mick Jagger. Hearing the full tale from anyone other than Bieler himself seems like a disservice, however, as the truncated version goes, when Jagger visited Atlantic Records back in the early 90s, Bieler and bandmate Phil Varone just so happened to be in the building at the same time. Before leaving, the Saigon duo made a pit stop in the men’s room, where they kiddingly discussed whether or not either would sleep with the legendary Rolling Stones frontman if the opportunity arose. It doesn’t take a genius to figure out where the tale went next as right on cue, they heard a toilet flush, a stall door open, and out walked the iconic rocker, who heard every single word. Finally, a Bieler gig wouldn’t be complete without the requisite performance of the anthemic “My Life,” with audience kazoo participation and all, and this night was no different. “Ladies and gentlemen, the New York City philharmonic kazoo ensemble,” joked Bieler afterwards on social media. It was a fitting conclusion to an evening of engaging stories, droll wit, and most of all, great music. Click here for Jason Bieler’s tour dates. Click here to explore Jason Bieler’s music.